I’ve been feeling rough this weekend so I decided to work on one of the easy jobs that I’ve been neglecting during Toxin’s development; finishing off the front end. For some reason the front end design is something that I absolutely must get right before I can envision the whole game. At the start of a project, I will spend hours trying to make a title screen and find the right font. If I get that right, everything else will follow. The design elements that I choose for the title screen seem to become the foundation for the graphical style of the whole game. Needless to say, Toxin’s title screen, like everything else in this supposedly simple abstract shooter was a struggle to get right. 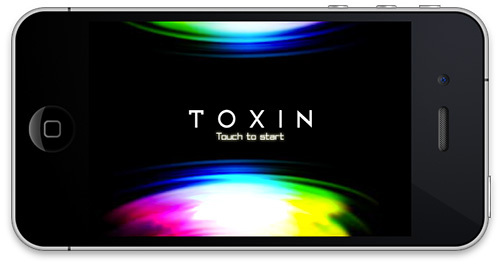 It was really just lucky experimentation that lead me to the nice animated effect I use for Toxin’s title screen. This effect warrants a detailed blog post of its own, and I’ll write one soon. Today I want to write about how I made the buttons for the main menu using a 19 year old graphics program. Toxin’s main menu. What you can’t see from this screenshot is how the glowing colours shift and change using multiple blended layers. 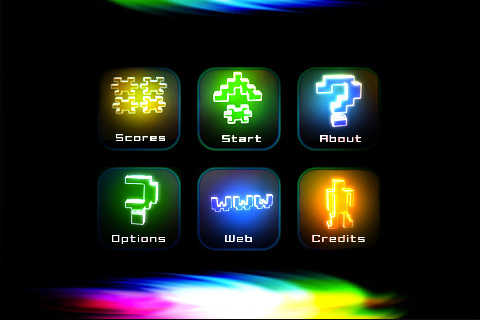 The icons on each button are simple pixel art images which were vectorised, loaded into 3D Studio Max, then extruded. My first icons were made by extruding text using the Topaz font, which was the default font on AmigaOS back in the day. I found it impossible to signify everything using text glyphs alone, so I decided to do some pixel art. I found Photoshop too frustrating to use for pixel art. It’s just not geared for that kind of work. You can’t delete quickly, and when you’re zoomed in the cursor does not snap to the pixel grid. So I decided to go full oldskool – I started up my Amiga Emulator, WinUAE, and loaded Deluxe Paint 4. In a couple of minutes I had knocked up some simple 16*16, 1 colour icons ready to be imported into 3DS Max. For those who don’t know, Deluxe Paint (invariably referred to as DPaint) was the de-facto standard graphics program on the Amiga computer, just like Photoshop is for today’s machines. It was also the industry standard for video game art up until the start of the 3D era. (At least it was in the west. I have no idea what was used by the Japanese games industry to create such pixel art masterpieces as Seiken Denetsu III and Final Fantasy 6. If you know, send me a message). It was developed by EA, believe it or not, back when they released interesting creative software like the Deluxe Music Construction Set, and published games like The Bards Tale. The first version was released in 1985, and was in development until 1994, which was probably the beginning of the end of the Amiga era. 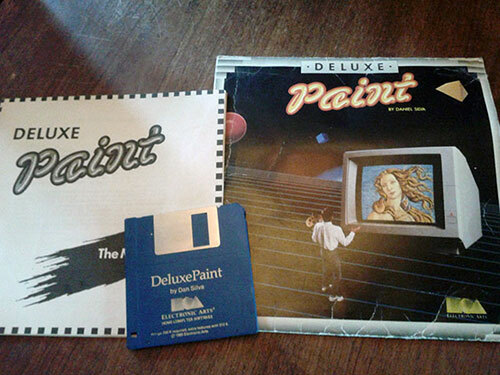 I still have my copy of DPaint I. I bought it for £5 in 1991 when I was a poor schoolkid saving my dinner money to buy games. By that time it was already six years old and two versions behind, but I spent hours on it drawing cyberpunk cityscapes and trying to copy Street Fighter characters from magazines.